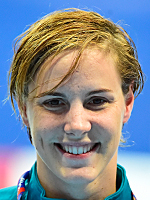 After a remarkable performance at the 2015 world championships, where she stormed to 3 freestyle golds (50m, 100m, 4x100m), Bronte Campbell is hoping to be one of the stars of the pool in Rio. The 22-year-old Australian will attempt the 50-100m freestyle double in Brazil, but she will have to contend with older sister Cate (100m freestyle world champion in 2013), who has also qualified for the two sprint events. Born in Malawi, the Campbell sisters moved to Australia as children, and discovered swimming during the 2000 Games in Sydney. 16 years on, they are dreaming of a place in the history books, as they look to become the first siblings to win gold and silver in swimming's most prized event, the Olympic 100m freestyle.